Use reportaproblem.apple.com to review your purchases, receipts, and report a problem with an item you've purchased. You can use reportaproblem.apple.com to view your purchases, receipts, and contact iTunes Store Support with any problems with your past purchases. When you open the page, enter the Apple ID and password that you used to buy the item, then choose Sign In. Subscriptions aren't managed through reportaproblem.apple.com. Learn how to manage your in-app subscriptions. If you're looking for a specific purchase, click or tap the Search Purchases field and enter the name of the purchase. To browse purchases, tap then choose Purchases, or, if you're using a Mac or PC, click Purchases. If you don’t recognize the amount charged to your bank, credit or debit card, multiple purchases might be grouped into a single transaction. You might not receive a separate email receipt for each. To find your receipts, tap then choose Receipts to see a list of your receipts. If you're on a Mac or PC, click Receipts. A receipt might not be available if you made the purchase recently. You can report a problem with any purchase you've made in the last 90 days. Find the purchase you need help with, then click Report a Problem and follow the onscreen steps. You might need to send us more information, contact the app developer, or download the item again. 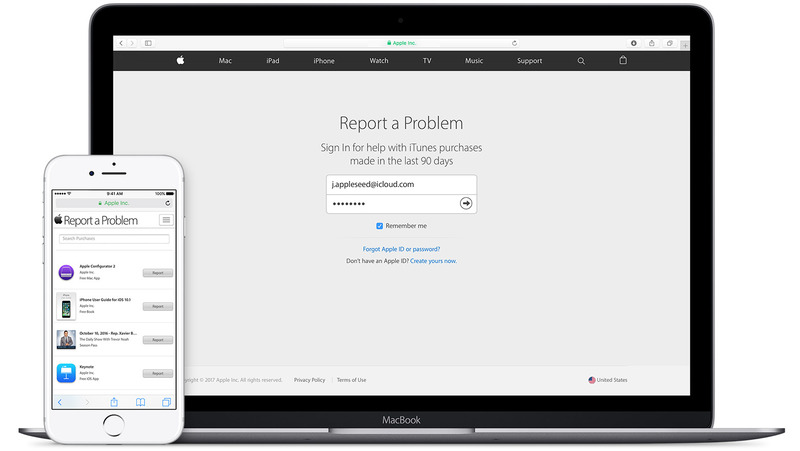 If the purchases you are trying to get help with don't appear in Report a Problem, or you aren't sure what Apple ID these charges are being applied to, check to make sure your email address has an Apple ID associated with it then contact Apple Support. Before you contact Apple Support, make sure your email address has an Apple ID associated with it. If you use Family Sharing and need help with a shared item, ask the family member who initiated the purchase to complete these steps. Learn how to get help with subscriptions and apps that unexpectedly quit, stop responding, or won’t open. Some items and purchases older than 90 days are not eligible for refunds. See the terms and conditions for more information. Learn about how iTunes Store purchases are billed – including purchases made with Family Sharing. If you get an email about a charge to your account that you don’t remember authorizing, check to see if the email is legitimate. Get help with subscriptions and recurring purchases through apps you might have downloaded to your device. Get help downgrading your iCloud storage plan. You can also view your purchases history in the iTunes Store on a Mac or PC.